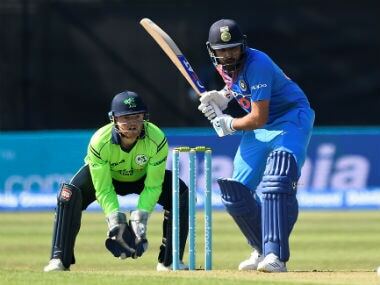 India's long tour of Ireland and England began with a crushing 76-run win over Ireland at Malahide. 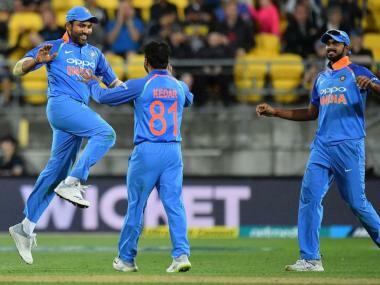 Propelled by a 160-run opening stand, the second-best for India in this format and the fourth-best overall, India racked up 208, which proved more than sufficient as the Irish batsmen appeared perplexed by the wily Indian spin twins. They finished on 132/9 in their allotted 20 overs, gifting India a welcome drink on their arrival in the continent. Here we rate the players on a scale of 1-10. Gifted a few balls on his pads early on, Rohit Sharma hit peak form in the series opener, slamming a magnificent 97 off 61 balls. He appeared to be the consolidator for most of the 160-run stand and looked set for a deserved hundred. However, he missed a slower one from Peter Chase to be bowled three short of his third T20I hundred. 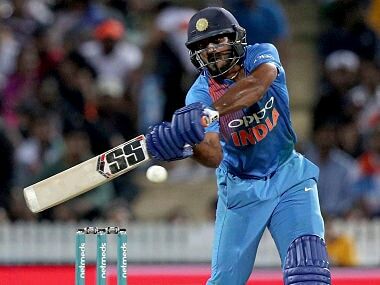 The highest run-scorer in T20Is in 2018, Shikhar Dhawan was picked over the in-form KL Rahul to open the innings, and justified the move with a typically aggressive innings. He began with a easy-as-you-like-it six over long on in the third over and added four more of those in his 45-ball 74. The innings should seal Dhawan's place at the top for the three T20Is against England later this summer. Buoyed by a sluggish wicket, chinaman spinner Kuldeep Yadav spun a web around the Irish batsmen with his variations. He prised out the wickets of Simi Singh and James Shannon in successive overs and added two more in the latter half of the innings to finish with career best figures of 4/21. Much like Kuldeep, Chahal used his craft to leave the Ireland batsmen bamboozled and finished with a three-wicket haul himself. However, he conceded at a rate of 9.5 an over, a trend of sorts in some of his recent T20I performances. With India up against a daunting England batting line-up in a week's time, Chahal might want to focus on being more economical. India appeared well on their way to another 250-plus T20I score after Rohit and Dhawan put on 160 for the opening wicket. All hopes of a massive final five overs was undone as Chase mixed up his pace and length to wreck India’s hopes. He picked four of the five Indian wickets to fall to finish with a career-best haul of 4/35. He would sleep sound knowing that his victims were Suresh Raina, MS Dhoni, Rohit Sharma and Virat Kohli. Bumrah gave Ireland an early jolt when he had Paul Stirling, their most dangerous batsman in this format of the game, caught at mid off with a back-of-a-length delivery. He would have had Shannon as well had Rohit held onto a catch. Bumrah grabbed one more late in the innings to finish with enviable T20 figures of 2/19 off four overs. The Indian seamer was unlucky to not have a wicket against his name after witnessing two catches go down off his bowling. He bowled economically, conceding just 16 off four tidy overs but couldn't buy a wicket. Playing his seventh T20I, opener Shannon appeared to be the most comfortable of Irish batsmen on Wednesday. He survived three dropped chances in the first four overs but remained unperturbed by the chaos. Even as wickets fell around him, Shannon stood tall to take the attack onto the Indians, finishing on an impressive 35-ball 60. 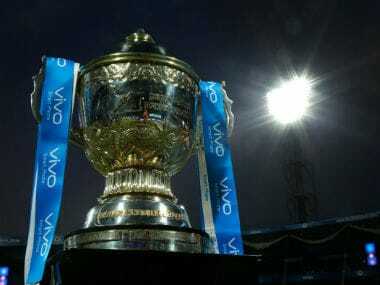 The former Indian skipper came up the order, a trend that could be a continuation of his Indian Premier League (IPL) campaign with Chennai Super Kings or a situational promotion, but couldn't quite tee off in typical fashion. His five-ball 11 had its moments, but his par rating stems from yet another impressive showing behind the stumps. He completed two easy stumpings off Chahal to add to his small cameo with the bat. The swashbuckling all-rounder hit a six off the only ball he faced in the innings, but returned to put up an unimpressive show with the ball in four overs. Pandya went for 36 in his spell, once again raising questions of how often he can be trusted to complete his quota of overs. A classy batsman, Balbirnie took his time to settle down at the crease, but appeared a tad hurried by the spinners. His 14-ball stay came to an end when Chahal befuddled him with a loopy delivery that turned away from him. At No 3 in T20Is, Ireland need more from Balbirnie than mere consolidation. The all-rounder is Ireland's big match player and the kind of guy who steps up when the situation demands. He went missing on Wednesday, though, barely contributing much with bat or ball. The 76-run hiding should awaken the beast in O’Brien when the two teams face off two days later. Picked over KL Rahul and Dinesh Karthik, Suresh Raina needed a strong showing to justify his selection. But walking in with 16 overs done in the innings, Raina had to go after everything, and ended up hitting 10 off six balls before departing to a poor shot. Raina will need to grab his chances irrespective of situation to remain in contention for a spot in the eleven. The veteran left-arm spinner began with a tidy over to the marauding Indian openers, but failed to build on his start. He was either too slow through the air or erred in line and length, gifting too many freebies to the batsmen. He could have had his name in the wickets column, though, if Stuart Thompson had held onto a chance given by Rohit. Stirling was tidy in his two overs but couldn't carry that confidence into his batting. He tried to hack a Bumrah short ball from outside off-stump and ended up spooning a catch to mid off. Stirling, more than anyone else, knows what Ireland need from him in this format. The seamer kicked off Ireland’s bowling performance with a tight one-run over but lost his fire towards the end, conceding 14 off his final over. With Chase bowling pretty well towards the end, Ireland will want their experienced seamer to step up when the teams meet again shortly. Though he studied in the same school as Chahal, Simi Singh had a different destiny awaiting him, one which brought him to Ireland. While his recent performances oozed confidence, Simi, much like his colleagues, struggled against the spinners and lobbed a wrong 'un from Kuldeep to the cover fielder. Thompson's opening over kick-started India’s fireworks in the first innings, with Rohit and Dhawan plundering two fours and a six off the over. The night failed to get better for him as he conceded three more boundaries in his next over. To make things worse, the pacer dropped catches off successive overs to let Rohit off the hook. The Irish skipper rotated his bowlers fruitlessly as India’s opener kept looting runs. Wilson could have perhaps tried a spinner early on in the power plays. He couldn't shore up their batting either and was stumped off Chahal's bowling for a single-digit score. The wicket-keeper has horrendous numbers in T20I cricket and did little to better his average or strike rate in the format with a nine-ball 7. He was completely squared up by an in-form Kuldeep, who made a mess of his stumps. The Indian skipper delayed his arrival at the crease as he sent out Raina, Pandya and Dhoni ahead of him to boost the run rate in the final few overs. He walked in with three balls remaining in the innings, contributed nothing and began his tour of the continent with a two-ball duck, a knock that brought his T20 average below the 50-mark.